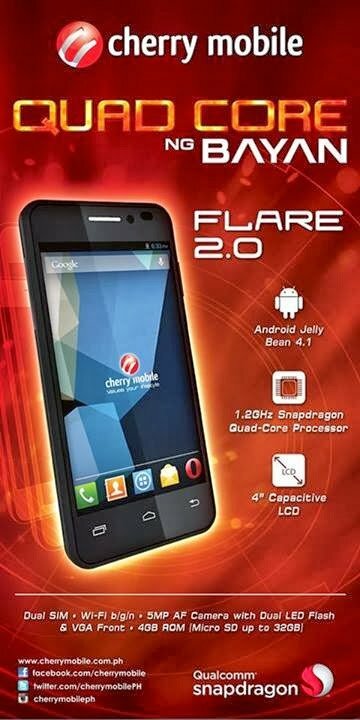 Cherry Mobile has recently released the Cherry Mobile Flare 2.0, successor to the dual core Flare, and is now powered by a quad core processor. Other than the new processor, the CM Flare 2.0 features a 4-inch display, 5 megapixel camera and runs on Android 4.1 Jelly Bean out of the box. See specs, price and where you can buy below. The Cherry Mobile Flare 2.0 is a dual SIM Android phone powered by a quad core Snapdragon 200 processor clocked at 1.2GHz. 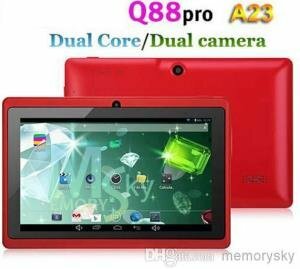 The processor is paired with a 512MB RAM for its memory and 4GB for its internal storage. There’s also a 5 megapixel rear facing camera with AutoFocus and dual LED flash, paired with a VGA front-facing camera. The specs of the Cherry Mobile Flare 2.0 pretty much tells us that this is an entry level Android phone. So don’t expect to much from it even if its powered by a quad core processor. It draws its power from a 1,600mAh battery so expect that recharging it will be more frequent. Check out the rest of its specifications below. The Cherry Mobile Flare 2.0 is priced at Php 3,999 only. It’s pretty much an acceptable price considering that this is only an entry level smartphone. It will be available starting September 21 at different Cherry Mobile kiosk nationwide.